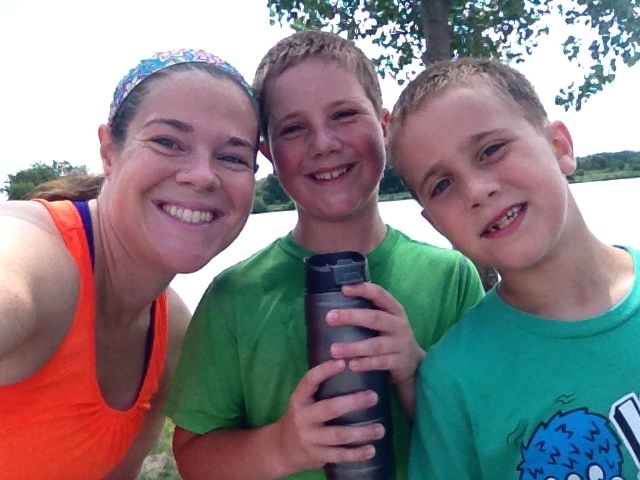 Runs for Cookies: Kids' first 5K! I was thinking about taking today as a rest day, but I was feeling kind of lazy toward the late morning. I decided to take the kids to the State Park, and let them do a "practice 5K". Eli has been begging me for a couple of years now to let him run a 5K race, but I always tell him that he has to train for it. I don't think he realizes how difficult it will be. He doesn't have the discipline to train, so he hasn't done one yet. There is a lollipop route at the park that is a perfect 5K distance, so I figured we could do a run/walk method and they could get a feel for how far a 5K actually is. I set my Garmin up for run/walk intervals--a feature I'd never used before. It's different from doing intervals, because it only keeps track of your 1-mile laps, but it will alert you when it's time to run and when it's time to walk. You can specify the time or distance of each run/walk segment, so I set the run for 1:00 (minute), and walk for 1:00. I figured that would be a good place to start with the kids. I told them we were going to take it very easy, and do a light jog for the running part, because I was nervous they wouldn't be able to finish. We filled their water bottles with ice water, and left them in the car, and then headed out on the path. The first 4-5 running segments went really well. 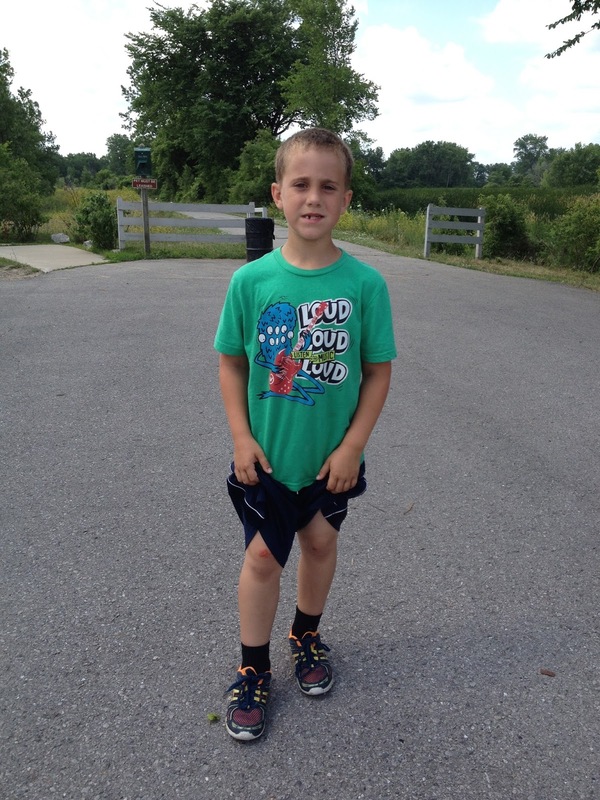 Noah, my almost-10-year old, doesn't like to run, so I was expecting him to complain the entire time. And I was expecting Eli (8 years old) to be pushing us to go faster, because he wants to SPRINT the entire distance ;) But Noah said several times that he felt really good to be running and he was glad that we went. Eli found a long stick on the ground during one of the walking segments (barely a half-mile into the run), and he started running with it. I told him he can't run with a stick like that, because he'll trip. He didn't listen, and within a few seconds, he tripped over the stick and flew onto the pavement. He scraped his knees and hands. Normally, he's a pretty tough kid, but he started crying and then being really dramatic. But, we had to listen to Eli cry for the next mile and a half. He was pretending to hyperventilate, and double over with pain, and all the other dramatic things I remember doing as a kid. Noah, meanwhile, was loving every minute of the run. He said he was getting tired, but he was excited to finish his first 5K. At the halfway point, Eli insisted that he had to sit down and rest, so we stopped for a couple of minutes. Finally, around mile two, Eli stopped crying while he ran. I think he was enjoying himself, but didn't want to admit it. I pointed ahead and told Noah that was the finish line, and he was really excited. When we hit 3.11, I told them that they'd done it--they ran their first 5K. Noah said, "YES!" and was SO very proud. Eli said he was never going to run a 5K again. Hahaha! The best part of the whole thing was that I could actually do something like this with them. Five years ago, I couldn't even teach Noah how to ride a bike because I couldn't run down the street. And today, I got to help them run a 5K! Noah asked me a couple of times, "Is this super easy for you?" And I told him the truth: "Yes, but it will get to be super easy for you, too, if you keep practicing." I watched Extreme Weight Loss this morning (recorded from last night) and I LOVED the episode. (Don't worry, no spoilers...) The woman on the show lost her husband to suicide due to PTSD after he went to Afghanistan. It really hit home for me, because my younger brother has PTSD (after serving in Iraq). I don't know how much he'd be okay with me sharing, so I won't get into specifics, but there hasn't been a single day that I haven't worried about him since he was discharged from the Army several years ago. That's one of the reasons I've been so excited that he's gotten into running. I've noticed such a change in him, and I love that I'm getting to spend more time with him because of the common ground we share. Anyway, seeing the woman on the show just broke my heart. After her husband's suicide, her young son was diagnosed with PTSD due to the suicide of his father! It's such a scary disorder, and I love that the show was bringing more awareness to it. Even when soldiers come home and seem like they are totally fine, they may have all kinds of things going on that you can't see. I didn't really comprehend that, or think much about it until I saw this photograph series about a veteran with PTSD. Seeing the photos and reading the captions blew me away, and I started to read more about post-war PTSD to gain some insight on what my brother may be going through. "War is a place where you lose who you were. And then if you get back, you don't have any idea who you are. And you're scared to death of what you might become." I obviously can't speak from experience, because I've never been to war; but from what others have told me, and what I've read, it sums it up so well. Anyway, the Extreme Weight Loss episode was a really good one, so if you haven't seen it, make sure you try to watch it! My brother, Nathan, is coming to the game tonight. Eli surprisingly doesn't get nervous under pressure, so I'm sure he'll do fine! Your selfies are awesome. What's the trick? Wow--I have an iPhone too, and did not know this! Thanks for sharing Katie. I am so tech UNsavvy! Thank you for the link to the PTSD photos. My husband suffers from this, and while I cried going through those it's nice to know that others feel exactly the same as him. How awesome is it that your husband and now your kids are running with you ?? what an awesome example you are to your family !! You and your boys should try geocaching (if you haven't already). It's a real life treasure hunt using the GPS from your phone and there are hidden caches all over the world. Can download the beginner app for free and try it out. I just started it and it is a really fun way to walk around town and get my steps with a fun goal (to find the geocache). I bet you would have a blast with them this summer doing this. Thank you for sharing the photo series of the veteran with PTSD. It was extremely moving and heartbreaking. Katie, very nice post. You have really cute kids and you are such a great role model for them. I don't know if you would be interested, but there is an app.."Run Zombies, Run!" and it might be awsome for your kids to hear as they are running, it's like being in a show, and you have to run to get supplies and there are zombies, it plays your music in between story lines, but it's really good, if you are into zombies. I use it when I'm walking, and just walk a lot faster when the zombies are breathing down my neck..hahaha...just have to be aware of where you are too, don't want to walk out into traffic because you are so caught up in the story. And you are so awesome with your kids! That was really well done to keep him going, you are such a great Mom! What a joy for you to be able to set such a shining example for your boys. I never could. My three boys grew up with a fat mom, who could only watch their activities, never participate. My oldest was a runner, however. Still don't know where he got that....his Dad wasn't a runner either, and definitely not me! But today, at 41, he still runs, that's one of the ways he controls his weight. I've got EWL recorded, I've got to watch the last two episodes, the one this week sounds very intriguing and motivational. Feel so sorry for those who have to deal with PTSD, in any way. I love Parenthood as well. Those shows when Kristina was fighting breast cancer really got to me. I guess because it hit close to home. It just seemed so real. I know how scared her husband Adam was, and that's exactly how I feel--just scared to death. That photo series was heart breaking. Awesome. Great job Eli and Noah! Laughed at loud at Eli's dramatics. I loved that episode of EWL too. I seriously cannot make it through an episode of EWL without tearing up. 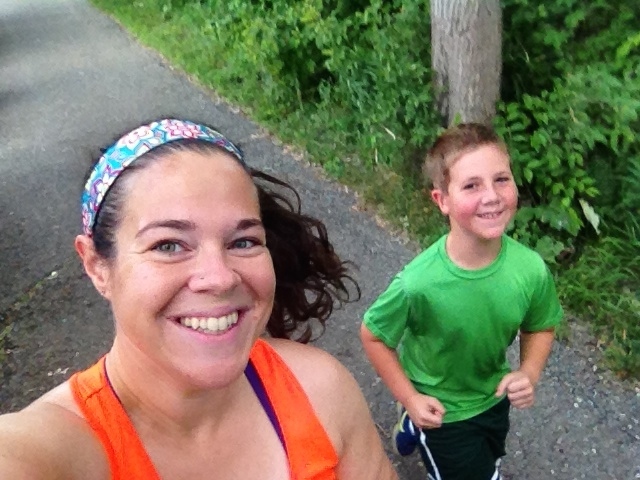 I love it that you're bonding with your kids through running. It's practical and way healthier than playing video games with them. I hope they also learn to love running like you do. Thanks for sharing your experiences with us. Cheers! This post made me think of yesterday with my girls. We were trying to get a kite flying (I've never been good at it and there wasn't really enough wind) which involved running down our road. When we gave up on the kite, my 5.5 year old said she wanted to run some. I said OK, but we needed to change into proper shoes. We just went back and forth on our rather short road as I didn't know when they would want to give up. My 2.5 year old wanted to join us. I loved being able to do that with them! It was a slow pace, but it got us all out and moving. It ended when my 2.5 year old fell and scraped her knees, but we were pretty much done anyway.